With the RuneScape storyline being more important than ever to the game, not knowing the game's lore can be a bit confusing. Fortunately, we have you covered. You can use this quick guide as a starting point or a reference if you get lost. Note: There will be some spoilers in some sections. If you simply want an overview without spoilers, read the "overview" section. RuneScape lore draws on many influences, such as Greek Mythology, Egyptian Mythology, J. R. R. Tolkien and H. P. Lovecraft. Lore is usually experienced in-game through interactive quests. RuneScape quests are generally considered the most unique feature in the game. Over the lifespan of the game, lore has become more complex and important. This heightened awareness of lore culminated with the sixth age storyline. The sixth age storyline is a storyline introduced in 2013 which involves the relationship between gods and mortals. The RuneScape sixth age storyline has three main pillars: The Tournament of the Gods, the Dragonkin, and the Elder Gods. The Tournament of the Gods involves gods fighting each other and attempting to gain power. The Dragonkin pillar involves a race of lizard-men who are attempting to remove a powerful curse from their body. Finally, the Elder God storyline features finding information about the unknown race and preventing their seemingly inevitable destruction of the universe. There are several other things we should mention. Let's start with setting. Most of the RuneScape game takes place on a world named Gielinor. There are other planets as well such as Freneskae (the first planet in the universe), Teragard (homeworld of the humans) and Yu'biusk. There's also Zanaris, which is the moon that orbits Gielinor. Elder Gods, Gods, and mortals are the main players here. Elder Gods - Beings that seemingly have always existed. They created the universe and all the worlds within it. They cannot be killed or destroyed as far as we know. Elder Gods created the Elder Artefacts (see below). Gods - Beings that are biologically immortal, but they can be killed using weapons called Elder Artefacts. The gods here are more similar to the Greek and Roman gods than to the Abrahamic God or the god(s) of other modern day religions. They can be very powerful but never omnipotent. Mortals - The vast majority of people in RuneScape. Not biologically immortal, like you (assuming you are not a deity!). Not all gods are made equal. There are seven tiers of godhood, with Elder Gods being the top tier. Godhood can be attained by mortals by using elder artifacts. The most common route to godhood is to kill a god using an artifact. Elder Artefacts - Objects created by the Elder Gods to assist them in planet creation. They are very powerful and frequently used by mortals and gods for selfish purposes. There are 12 artefacts, but the main ones are the Stone of Jas and the Staff of Armadyl. Anima Mundi - Life force. This is what drives magic and life. Elder Gods apparently need anima to survive and create planets to supply themselves with anima. Anything else that occurs on planets is nothing more than a side effect to the Elder Gods. The current universe has depleting anima levels, and its destruction by the Elder Gods in favor of new worlds that contain more anima seems imminent. Humans - The most abundant race on Gielinor. You should be familiar with humans from your experience in the real world (well, hopefully). In RuneScape, they follow a variety of gods. Most humans are aligned with Saradomin. Elves - Elves are a common race found in Fantasy genres; RuneScape is no exception. Elves have long life spans and are users of crystal technology. They follow the goddess Seren and live isolated from the rest of the world in Tirannwn. Dwarves - Another race found commonly in fantasy works, dwarves are diminutive humanoids. Dwarves are expert smiths, miners, and notable for their technology. They are found around Gielinor but many live in the dwarven city Keldagrim. Gnomes - Gnomes are small humanoids living in and around nature best known for their transportation and cuisine. They live mainly in the Tree Gnome Stronghold and Tree Gnome Village, however there is a currently hidden gnome city Arposandra found beneath Arandar. Out of all races, they seem to be most in touch with the anima mundi of the planet. Appear to be aligned with Guthix. Elder Gods - A powerful, unknown race that created the universe. They are the most powerful beings in the game. Their origins are unclear. Elder Gods seem to have little awareness or interest in other lifeforms. Demons - A group of beings from the planet Infernus. There are two types: Cthonian (Zaros following) and Infernal (Zamorak following). The Infernal were long slaves to the Cthonian but this ended with a revolution, sending most of the Cthonians into the abyss. Infernal are mainly inspired by mythology and Cthonian by H.P. Lovecraft mythos. Mahjarrat - The Mahjarrat are an incredibly powerful but small tribe of a race known as the Dreams of Mah. Originating on Freneskae, the Mahjarrat were brought over to Gielinor to fight in wars. They are more or less biologically immortal, but they can die in battle or in a sacrifice that takes place every 500 years. The sacrifice is needed to maintain their strength and health. They are aligned to Zaros or Zamorak, though some can be considered rogue. Dragonkin - The Dragonkin are the oldest known race, predating the current universe. They are bound to the Stone of Jas and are compelled to kill any abuser of the stone. They are infertile but have experimented on how to fix this. These experiments led to the creation of dragons. Aviansie - Aviansie are a bird-like race. They come from the planet Abbinah. They all follow Armadyl, who is also an Aviansie. Vampyres - Similar to Vampires in our culture, these are blood sucking, flying humanoids that live in Morytania. Almost exclusively follow Zamorak. The universe begins with the Elder Gods hatching from their eggs in Freneskae. Four out of the five eggs hatch. The fifth is Mah's egg; she is assumed to be stillborn. The Elder Gods begin to create worlds in order to supply themselves with anima mundi (life force). They create many worlds, however have difficulty creating a perfect world with a balanced anima. Finally they create Gielinor, a perfect world. They slumber but not before placing a curse on the dragonkin, a survived race from the prior universe, which forces the dragonkin to guard the Stone of Jas. Later, Mah awakes but is mentally disabled and with the maturity of a four year old. She creates Zaros and Seren as toys, however they eventually leave her. Mah remains incapacitated and eventually becomes comatose as she has no anima left to consume. Unfortunately for the Elder Gods, the imperfect worlds they created have a side effect. The unbalanced anima leads to the formation of conscious life. These lifeforms, which will be referred to as mortals, begin to live and stumble upon the Elder Artefacts left by the Elder Gods. Many use these to attain godhood. After some time, Guthix's homeworld of Naragi is invaded by gods. His entire race is wiped out yet he survives. Using an artefact named the Elder Sword, he kills a god named Skargaroth and becomes a god himself. He uses his newfound power to travel to various places, eventually finding Gielinor. Guthix uses Gielinor as a sanctuary from gods. Although no mortals live on Gielinor when he arrives, he promptly changes that. He invites mortals from other planets such as humans, dwarves, gnomes, and more. He also invites the goddess Seren and she brings her elves with her. Guthix does not wish to be worshipped, but finds out he is being worshipped for his almighty power against his wishes. He grows a disliking of this and decides to enter a slumber with the intention of being forgotten. Gielinor's existence does not remain secret forever. 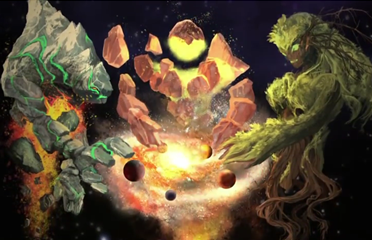 The Second Age is marked by the introduction of gods and their races into Gielinor from other planets. Most notably, Zaros arrives. With his pack of Cthonian demons, Zaros creates a massive military empire throughout the land, taking control of control of Asgarnia, Misthalin, and Morytania. The empire is something of an analog to the Roman Empire: it is the most powerful force in the world, shares some governmental features (with praetors, legions, etc) and its inhabitants speak Latin. Zaros eventually begins to try and take control of the Kharidian empire in the south. At the time, the Kharidian empire is ruled by a pantheon of gods known as the Menaphite pantheon. This pantheon is a family of gods with Tumeken and Elidnis as the parents and Icthlarin and Amascut as the son and daughter. His initial battles against the Menaphites are successful and Zaros seems to be well on his way to taking the empire. Desperate for help, Icthlarin and Amascut go to other worlds to recruit soldiers. They stumble on Freneskae, which is now populated by the warlike Mahjarrat. Impressed by the power of these soldiers, Icthlarin and Amascut ask them to help them with their military efforts. The Mahjarrat agree and travel back to Gielinor. The Mahjarrat instantly change the tide of the war and give the Menaphites significant gains in the war. Unfortunately Amascut is driven insane on Freneskae by unknown means and is never the same again. Eventually, a Mahjarrat named Sliske becomes angered with the Menaphites, switches sides, and joins Zaros. More Mahjarrat follow with Zaros' promise of more power and soon nearly all Mahjarrat are fighting against the Menaphites. Without the Mahjarrat, the Menaphites stand no chance. In a last act of defense, Tumeken and his entire army self destruct and kill most of Zaros' army. A select few Mahjarrat are saved by Azzanadra, but the army is left to retreat. The Kharidian empire remains with the Menaphites, but it becomes a desert wasteland. Despite the losses, Zaros' empire is still powerful. Zaros decides that his presence is no longer necessary and becomes a mere figurehead. His absence grants him the name "The Empty Lord." Eventually, Zaros' top warlord Zamorak betrays him using the Staff of Armadyl. Zaros flees Gielinor (though his empire remains) and Zamorak attains godhood. The other gods shun Zamorak from Gielinor. Zamorak travels to the demon homeworld Infernus and stages a revolution. In the process he gains an army of demons. With this new found power, Zamorak returns to Gielinor with intentions of gaining power. The Third Age is best known as the age of the God Wars. Upon returning, Zamorak attempts to gain control of areas held by the Zarosian Empire. He is mostly successful, however he has difficulty maintaining control of them and they usually land up in Saradomin's hands. Yet Zamorak does have some noteworthy success against Saradomin; with the help of vampyre Lord Drakan, he claims the powerful Saradominist city Hallowvale. In response to this, Saradomin sets up a millitary campaign to retrieve Hallowvale. The campaign fares well but near completion the Saradomin“s generals are turned into undead wights by Sliske. This ended the campaign and Zamorak held onto Hallowvale. Despite the conflict, Zamorak and Saradomin eventually find common ground. Both sides realized it was in their best interest to eliminate the Zarosian faction, which was feasibly powerful enough to reclaim land. They ransack Zarosian cities in their best attempts to eliminate any indication of who Zaros is. They were also able to overpower Zaros' de facto emperor Azzanadra and Zaros' top millitary general Nex. Due to their immense power, both are imprisoned as they can not be killed by either Saradomin or Zamorak. Other followers who were not so powerful are killed or, if lucky, sent into hiding. Unfortunately, the war did not end there. Zamorak and Saradomin keep fighting and Zamorak is pushed back to Forinthry (where the wilderness is today). Saradomin decides he needed to deal a killing blow to Zamorak. He teams up with the gods Armadyl and Bandos in order to create a powerful weapon called the godsword. Armadyl's followers, the aviantese, are tasked with forging the weapon. Zamorak ultimately discovers the plan and sends an army to take the godsword from the aviantese smiths. Although the alliance is able to hold off Zamorak, soon the alliance turns on itself. The battle becomes a free-for-all for the godsword. 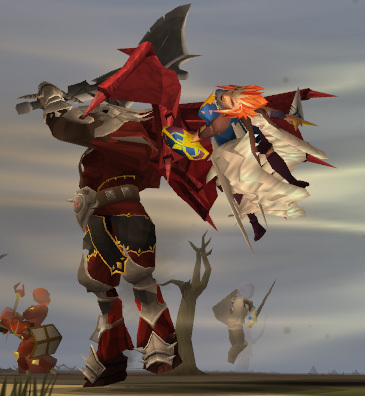 The godsword ironically shatters during the battle and the alliance reforms to defeat Zamorak and begins to make progress on his position in Forinthry. For purposes of having an interesting plot, Zamorak then rediscovers the Stone of Jas. When he is cornered, he uses the stone's power to explode the area around them. This causes Forinthry to become a wasteland. The blast, which damages the planet's anima, awoke the slumbering Guthix. Realizing that his hope for a world free of gods was failing and he was witnessing the end of another world, Guthix unites his followers and puts an end to the war. Guthix, being far more powerful than any of the other warring gods on Gielinor, steamrolls over the other factions. At this point, the gods are asked or forced to leave. Guthix then places a god barrier on Gielinor called the Edicts of Guthix. Following this, he returns to sleep. Free of Gods, the mortals flourished in the Fourth Age. Hence, the Fourth Age is referred to as the age of mortals. The Fourth Age laid down the framework for most modern day empires, yet it is relatively uneventful. Early on, the dragonkin are enraged by abuse of the stone in the God Wars and exact revenge on the land. The dragonkin are eventually driven back by Robert the Strong, a human warrior using a special ore named bane to damage them. Cities such as Varrock are founded. Varrock is eventually invaded by the Mahjarrat necromancer Zemouregal, but the invasion is held off by the human hero Arrav. The elves, who were isolated from the God Wars by the Arandar mountain range, finally trek over Arandar and establish something of an empire in modern day Kandarin. Unfortunately a civil war breaks out among the elves, resulting in disorganization and the eventual loss of this empire to humans. Towards the end of the age, human wizards at the Wizards' Tower discover rune essence. This gives them an unlimited supply of runes to use magic with. This marks the end of the fourth age. With their ubiquitous source of magic, humans are able to dominate militarily and also provide numerous improvements to day-to-day life. This makes the Fifth Age the Age of Humans. Increases in power and literacy lead to increased importance in religion (usually figureheaded by Saradomin), though secular ideas remained important. Not all humans were ready for magic. A group of humans known as the Fremenniks eventually lead a crusade in hope to stop abuse of magic. This fails. Other events such as the destruction of Crandor by the dragon Elvarg, splitting of Ardougne into two halves, and the never ending war between Zamorakian and Saradominist knights. Things quickly heated up during the last "year" of the Fifth Age, year 169. This is the year that the player finds himself in at first and chronologically before 2013. Several key players, such as Azzanadra and the God Wars generals, are freed from their prisons. With a sacrificial ritual looming, the remaining Mahjarrat begin plans to get more power. This was most notably done by Lucien, who attempted to achieve godhood. Using the Stone of Jas and the Staff of Armadyl, he becomes the most powerful Mahjarrat. Unfortunately his abuse of the Stone of Jas angers the dragonkin, whom are able to murder him after the ritual. With the Staff of Armadyl and Stone of Jas ownerless, they are deviously taken by Sliske. The fifth age end when an archaeologist finds Guthix's resting place. This leads to a rush to get to Guthix's chamber as all sides wish to kill him to gain power and end the edicts. A battle ensues. 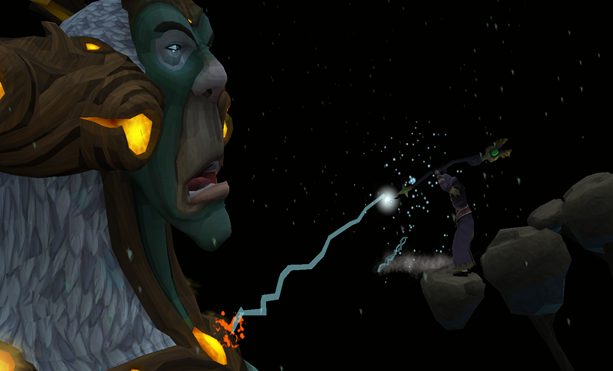 While the struggle continues, Sliske manages to sneak into the chamber and kill Guthix with the Staff of Armadyl. In Guthix's last action, he asks the player to look after the world for him and gives him the World Guardian blessing. This allows the player to be somewhat resistant to the forces of other gods. With Guthix gone, gods return to the world. Saradomin is the first to do so. He is quickly followed by Zamorak, who battles him at Lumbridge. Saradomin defeats Zamorak, but Zamorak is able to escape and avoid death. Sliske enjoys the battle and calls for a Tournament of Gods, with the victor receiving the Stone of Jas. Things only worsen with a fight between Armadyl and Bandos. Armadyl kills Bandos, becoming more powerful. 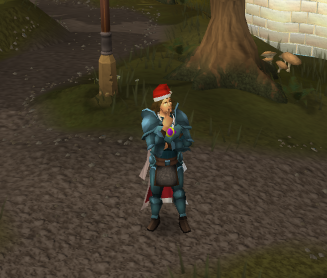 Zaros also returns to Gielinor, although secretly. He warns of an event called the "Great Revision." The Great Revision involves the destruction of the universe by the Elder Gods, who will then create another, better universe. It is up to the mortals and gods to prevent that from happening. How this is done is unclear. Dragonkin enrage with the presence of more gods (many of which are stone abusers). They kill the god V. and further attempts to cure their infertility. The elder god Mah is killed when it is discovered she is leeching off energy from the Mahjarrat, Zaros, and Seren. With Mah gone, there is no longer any need for Mahjarrat rejuvenations, effectively making the Mahajarrat immortal. Other events that occur in the sixth age are the end to the Elven civil war and the fall of the Red Axe in Keldagrim. Sliske's tournament concludes. Zaros uses manipulation to take control of the stone, but before he can use it for his ends, the dragonkin destroy the stone. In a fight, the player kills Sliske, but it appears Sliske's death is not all what it appears to be and Sliske may be holding refuge inside the player's body. The Sixth Age is still in progress and not yet history. More events will be added as new sixth age quests are released. Guthix was a powerful, benevolent god who brought most races to Gielinor. Guthix is well known as the god of balance, but he's a bit more than that. Guthix came from a planet that was destroyed by gods, and hence had an intense hatred of them. He found Gielinor and treated it as a place where mortals could be free of gods. However, he soon found out that mortals began worshipping him. In response, he entered a long slumber, hoping to be forgotten. He awoke to end the God Wars and put a barrier on Gielinor, preventing gods from entering Gielinor, called the Edicts of Guthix. Other than that he remained sleeping for most of the planet's history. Unfortunately worship of him never stopped and he quickly realized that gods and humans cannot coexist. He allowed himself to be killed, removing the Edicts of Guthix but also putting the planet into the hands of mortals. His last act is to bless the player as World Guardian, meaning you are somewhat resistant to the actions of Gods. Sliske is a devious Mahjarrat who killed Guthix. He is not a god but his mastery of the shadow realm allows him to hold his ground against gods. Weakly aligned to Zaros (despite his eventual excommunication from the Zarosian church), Sliske holds the Stone of Jas and allegedly plans to award it to the god who has killed the most other gods. In this way, he can be seen as the main antagonist in the storyline as he intends to create war instead of preventing it. He is frequently described as the Joker to the player's Batman, yet this isn't a perfect analogy. Although the player and Sliske have different methods, one could argue they have the same ultimate goal: a land free of the influence of gods, which Sliske may wind up doing through incredibly violent means. Sliske's reluctance to attain godhood, which he probably can attain given the artefacts in his possession, may hint towards this. A powerful god frequently known to be the "good" god, he is technically known as the God of Order. He is a human god who is the most widely followed god on Gielinor. Despite his good name, his character isn't perfect. He is known for having a short temper and using any means possible for success. Saradomin is followed by humans and other races such as Iceyenes and Centaurs. The god frequently painted as the "evil" god, Zamorak is technically the God of Chaos. Zamorak has established land in Morytania and several underground cults elsewhere. A Mahjarrat before becoming a god, Zamorak rose through almost killing his master Zaros (see below). He can be seen as the spark for the God Wars of the Third Age. Zamorak is better than he is painted; he believes Chaos brings out the best in people. In this way, he can be seen as an anarchist and radical Social Darwinist. An extremely powerful god who is also known as the Empty Lord. Zaros is the god of control and incredibly manipulative by nature. He was created by the Elder God Mah and bound to her in the world Freneskae, but ended up leaving anyway. He believes that gods (him in particular) bring out the best in mortals and can help mortals achieve their maximum potential. Zaros held a powerful empire before the God Wars, but now apparently prefers to act as a guardian and light to the world. His current existence is kept secret from almost everyone in RuneScape. Zaros is pursuing Elder Godhood and can be seen as attempting to become fate itself. Zaros' cunning and amoral behavior along with his attempts to bring out the maximum potential of others points to a Nietzschean influence, while Zaros' manipulation appears to take notice of Machiavelli. The bird-like god of law, Armadyl is a powerful entity. He believes that mortals and gods can live together and plans to use his power to create global safety and justice to those who stand in his way. This can be seen when he kills Bandos in the second World Event. He is also the namesake of the Elder artifact "The Staff of Armadyl." Armadyl did not create this staff, but slightly altered it for unknown reasons. Seren - Goddess of the Elves and Goddess of Tranquility created by Mah on Freneskae. Seren is incredibly powerful (around the same level as her counterpart Zaros) but rarely uses her power for military purposes. Instead she prefers to stay isolated with the Elves in Tirannwn. Jas - The most elder and powerful of the Elder Gods. She created the Stone of Jas, the most powerful elder artefact. Though Jas has been sleeping for many years, she seems to be the most likely sympathetic to the player's cause. Jas lies below the southeastern Kharidian desert. The Godless - Not an individual, but an important faction worth mentioning. The Godless are a group of unorganized people who wish to free the world from gods. They often suggest doing so through violent means and are often labeled as radicals. Not all are like this however. Often seen in line with Guthix's ideas, though they are not exactly. Icthalrin - Icthlarin is God of the Underworld. He is based on the Egyptian god Anubis. He is relatively weak (usually considered a demigod) but plays a major role in Missing Presumed Death. Icthlarin comes off as cautious and insightful. He seems to have no desire for power. Icthlarin's inclusion in major Sixth Age events is probably due to his antagonistic past history with Sliske. Bandos - Recently deceased God of War. He believed mortals were best when at war, hence was quite the fan of it. Bandos was followed by ogres, goblins, cyclopes, trolls, etc., many of which still operate under his banner. His brutish nature eventually got him involved with a war with Armadyl. He lost both the war and his life. His remains can be seen near Goblin Village. Bandos was also the ultimate antagonist in the cave goblin quest series. V------ - Fremennik who created runecrafting altars using the Stone of Jas. He is treated as a hero, but is a god as well. Unfortunately for him he is killed by a dragonkin for abusing the stone. There are some notable detractors who believe that V. survived the dragonkin attack (and possibly relaxing in a bar with Elvis Presley and Jim Morrison). Goes/went by many names, but usually sticks to "V." as all his names begin with V. Before the Sixth Age, V. was among the most mysterious figures in RuneScape, acting as something of a Pynchonian presence. He is better described in Hero's Welcome, where he is killed. Strisath - An enraged dragonkin who has killed many abusers of the Stone of Jas. Azzanadra - A Mahjarrat who is Zaros' top assistant. He plays an important role in bringing Zaros back to Gielinor. He is also the one spoken to when discussing recent events, as Zaros is presumably busy doing something else. Officially, you are the World Guardian of Gielinor. Guthix gave you this responsibility in the final moments of his life. The responsibility entails keeping with Guthix's idealistic vision of a world free from the influence of gods. Guthix attempted to do this himself but failed as he himself is a god and was worshipped. In the end, he decided only a mortal can bring this vision to reality and places the responsiblity on you. To allow yourself to stand up to individuals more powerful than you, Guthix has given you some resistance to their actions. Although the story may seem set in stone, you have the option to change certain things. Your job might be to protect Gielinor from the gods, but to what degree you do this is up to you. For example, you can pledge alliance to a god and choose to favor this god in quests. This would optimally change the final end to the storyline. One god may come on top, no gods may come up on top, all gods might die, etc. The full extent to which your decisions affect the storyline is yet to be seen, but we have seen the player able to weaken gods with the choices he/she makes. There are several logical discrepancies in RuneScape. For example, Draynor Manor is similar in size to Ice Mountain. These can be partially explained by something called scale theory. The idea is that the game is an intermediate between the player and the actual world of RuneScape. Things of not so much importance, such as random terrain, are scaled down while other things of importance are not. So Ice Mountain is the same size as Draynor Manor not because it's a small mountain but for practical purposes. For some more information, you can check out our lore section. For discussion about this and the latest theories, you can read our forums or the RSOF lore subforum.